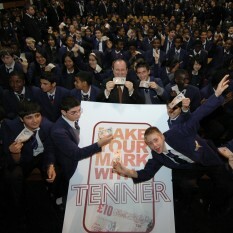 Make Your Mark with a Tenner entries were judged on how much money was made from a single ten pound note, in just one month. This could be by an individual, or as a team. Where a team name is listed rather than an individual, the profit made is the average per tenner ‘invested’, rather than the overall profit. The top 50 profit-making entries received a copy of Change the World for a Fiver and Richard Branson’s Screw It, Lets Do It, to inspire them to continue turning their ideas into reality. They also got the chance to put their questions to the Make Your Mark Connectors, a group of more than 100 inspirational entrepreneurs with contacts who can make things happen. In addition the top three were awarded a cash fund which they can use to further their enterprises or to add to the good causes they’ve previously helped. Fazila Dadabhoy made and sold doughnuts, and made a profit of 410. She donated the profits to Macmillan Cancer Research, Islamic Aid and Oxfam. Richard Robson challenged others in his class to think of ways to raise as much money as they could for chosen charity of HCPT, and made a profit of 370. The profits were used to sponsor a special-needs child to go on a holiday to Lourdes in France. The 2007 highlights brochure features profiles on the the top individual and group entries, as well as details of the special awards given for the most imaginative ventures, crazy ideas, eye-catching schemes and more! Made and sold doughnuts. Profits donated to Macmillan Cancer Research, Islamic Aid and Oxfam. Challenged others in his class to think of ways to raise as much money as they could for chosen charity of HCPT. The profits were used to sponsor a special-needs child to go on a holiday to Lourdes in France. Donated their tenners to the NSPCC Timeout Project and then invited local businesses to match their donation to generate more money. Set out to raise money to help rebuild a school in Kikumini in Kenya. They raised 1,000 between them via a range of activities including raffles, an African treasure hunt, promotions and PS2 competitions. Used 10 to invest in posters and products, and set up a hairdressing and nails service. Re-invested profits into business. Made and sold cakes, taking orders and then buying ingredients on credit. Put on a Big Brother stage show, with the opportunity to win entry to Madame Tussauds. Used the profits to buy DVDS, computer games and toys to donate to the Kingfisher Childrens Ward at Dorchester Hospital. Set up a company selling origami to local businesses.Profits were donated to their partner school, Toli Secondary School in South Africa, to sponsor five students through three years of secondary education. Organised a raffle and a Guess the name of the bear competition. Donated all her profits to SCOPE, in memory of a friend who had passed away. Set up a tuck shop at school, including some healthy snacks. Sold a selection of sweets to pupils at school. Carpentry student made frames for textile department to stretch canvases on. Made brightly coloured cushions. Used the profits to make 30 cushions which she donated to children at Great Ormond Street Hospital. Carried out a range of odd-jobs, including car washing, bin cleaning and hoovering. Used his money towards being able to attend the 21st Scout Jamboree in July 2007. Made cakes and organised several cake sales. Donated profits to Compassion UK. Ran several themed, creative workshops for the younger pupils at school. Used profits to continue with the workshops. Made and sold stone masonry house numbers. Started a car washing business and used the profits to buy a ticket to visit his great uncle in Northampton. Made and sold cakes. Donated money to Comic Relief. Bought and sold phone stickers that lit up when the phone received an incoming call or text message. Team kept half the profits, and donated the other half to charity. Home-schooled brother and sister who made sculptures using recycled materials from local industry. Profits were shared between themselves, Scouts and Plan International. Set up an area at school for students to relax and socialise in, and then charged an entrance fee and sold refreshments. Profits were donated to ORBIS. Made and sold samosas at school. Donated some of the money to SOS Childrens Village in Bethlehem. Team who made and sold a selection of products, including Hama coasters and aerial view photographs of the Jurassic coastline CDs. Kept some profits and donated to a selection of good causes, including Children in Need and Friends of the Earth. Organised a film night and raffle. Set up a car washing service, which was particularly successful amongst teachers. Intend to continue with the business. Made and sold everlasting flowers to order. Used the money to buy items from charity shops and car boot sales, which they then sold online. Donated profits to local charities. Made and sold ginger marmalade and damson jelly. Donated profits to City Farm, Coventry. Made business cards and sold them to teachers at school. Provided a car washing service to their teachers, and donated a third of their profits to CLIC Sargeant charity. Recorded songs with a personal greeting. Already has future bookings and hoping to continue with the project. Set up a chocolate fountain at school. Gave profits, and donated arts and crafts materials, to Edwards Trust charity. Put on a rock concert, and used their profits towards music equipment. A range of activities including cake sale, sponsored swim and selling a range of homemade crafts. Donated some of the profits to Cancer Research UK. Sold raffle tickets for a variety of prizes, including a trip round Choice FM. Gave the majority of the profit to charity. Created a jewellery making company. Provided a cinema at their school, selling popular snacks and showing the latest films from different cultures. Profits were donated to the school, and four charities. Made and sold cornflake cakes, as well as various other snacks. Kept half of the profits and donated half to charity. Sold drinks, chocolate and crisps to pupils at school. Offered a variety of services, including selling plants, cleaning windows and doing grocery shopping. Organised a disco in the local village hall during the school holiday. Sold Indian jewelley and hair clips imported from India. Donated all the profits to an Indian charity. Recorded an original song to challenge the negative perceptions of teens in society. All profits were donated to The Sickle Cell Society. Bought USBs from a product company which they then sold on. Split profits between the different team members. Set up a Henna stand at school, and were asked to do a special workshop for the special needs department. Made and sold tablet at school.